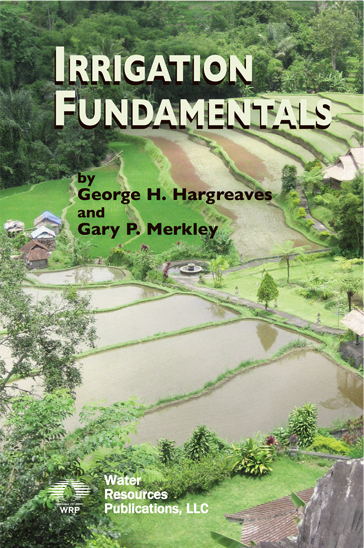 IRRIGATION FUNDAMENTALS is a comprehensive text on the basic principles and practices of applied agricultural irrigation. Written over a period of more than 10 years, it is based on the authors' extensive experience in farming, consulting, research, teaching, and other related agricultural activities. The book is for use by teachers of introductory courses in irrigation, farmers who have some basic technical knowledge, and for administrators who need a general understanding of irrigation as an aid for policy decisions in water resource development and planning. Various factors that influence crop yield and production including climate, fertility, water, drainage, and agronomic practices are addressed. The various irrigation methods such as border, basin, contour, furrow, sub, sprinkle, and drip or trickle are described; and conditions are given for selection of the appropriate method to use. Recent developments and new technology are included herein when they have obvious practical applications, but for the most part the material presented in this book is based on well established principles and practices. Much of the content is very practical and much is essentially nontechnical. Nevertheless, some of the material covered in this book goes beyond the basic concepts in an attempt to better describe the relationships and techniques employed by irrigation scientists and irrigation engineers. The future of the world depends very much on how we manage natural resources. Since the year 1900 there has been a ninefold increase in global carbon emissions from burning fossil fuels, and the world population has increased about 3.7 times in this century. Vast areas of forests have been destroyed, and irrigated lands now produce 40% of the food supply. Due to depletion of groundwater reserves and an increase in population, irrigated area per capita is declining. Consequently, the irrigation of additional alluvial lands is a strategic necessity for all of humankind. Much of the alluvial lands cannot be made productive without prior development of water resources through flood control, drainage, and irrigation. The production of electricity through hydropower and the production of alcohol fuel from irrigated crops, as has been practiced for many years in Brazil, can slow the increase in carbon emissions. Such diverse developments are typically not separable; rather, they must be considered as integral parts of a comprehensive development plan. The conservation of natural resources and increasing productivity of irrigated lands are also strategic necessities. Much of the current technology is highly transferable and crop yields can be significantly increased on lands already under irrigation. The authors have worked in many countries in connection with resource inventories, teaching, and the planning, development and use of irrigation as a tool for increasing production and providing employment. They have written extensively and have been honored for their achievements. They have considerable experience with everything from primitive low-technology irrigation developments to highly developed irrigation in the USA and in dozens of countries around the world. Both of the authors have dedicated their careers to teaching, research, and consulting in agricultural irrigation and water resources development and planning. It is their hope and expectation that this book will provide incentives for investigating and documenting land and water resources, improving development, increasing crop yields, conserving resources, and improving the environment.